Green is the new black. Recycling bins, compostable product packaging and wind/solar energy are just a few of the new and hottest trends. But hidden within many American cities is a larger-than-you-think population of people who dub themselves urban homesteaders; they aren’t just going green, they’ve been green. Now others seem to be catching on. Urban homesteaders live by basic rules centered on an idea called permaculture, a compound word suggesting a practice that sustains itself over time. That definition, and a whole lot more, can be found in a new book, Urban Homesteading: Heirloom Skills for Sustainable Living (Skyhorse Publishing, New York City; 292 pages/softcover; $16.95), by Rachel Kaplan and K.
Ruby Blume. Kaplan knows of what she speaks: She has been an urban gardener for more than 15 years. Within this easy-to-understand, wellorganized guidebook to homesteading, defined on urbanhomestead.org as “transforming a city or suburban home into a property that produces some or all of its residents’ own food and other subsistence needs,” the authors have compiled projects, ideas and values on permaculture from a wide variety of sources. The two acknowledge that no one has a handle on every aspect of homegrown sustainability, so they have gathered an abundance of knowledge from fellow homesteaders, validating the importance of collaborative community within this way of living. Throughout the book, Kaplan eloquently reminds readers, without being preachy, of why the earth is worth preserving. This how-to book suggests small changes readers can make to start homesteading themselves, no matter where you live: city, suburb or countryside. Urban homesteading encompasses a large range of different green and sustainable ideas. Simply put, the practice is a return to the basics. Urban homesteading embodies skills and practices that many of us have forgotten while living our hectic lives. These homesteaders are resurrecting a simpler time by gardening, harnessing renewable energy sources, drying clothes on a line instead of in an appliance and many more ideas outlined in the book. In Syracuse, an excellent example of urban homesteading exists on the Near West Side, at Alchemical Nursery. Frank Cetera, who works as a certified business adviser specializing in green business development for New York state, is a cofounder of the group whose mission is, in part, providing educational resources, dialogue space, networking tools and project development to develop equilibrium between humans and the environment. Cetera is renovating a house at 717 Otisco St., looking forward to the day when the clay plaster walls, earthen floor and masonry stove will be completed. Not only does this work demonstrate the lifestyle choices Cetera has made, but it’s showing the neighborhood the importance of the environmental changes he believes we all need to make. “The whole theory behind an urban homestead is for everything to work as one system: landscapes, agriculture and the residents all working as one unit to thrive,” he says. Cetera hopes he can move in before winter so that he can start on the house’s interior. 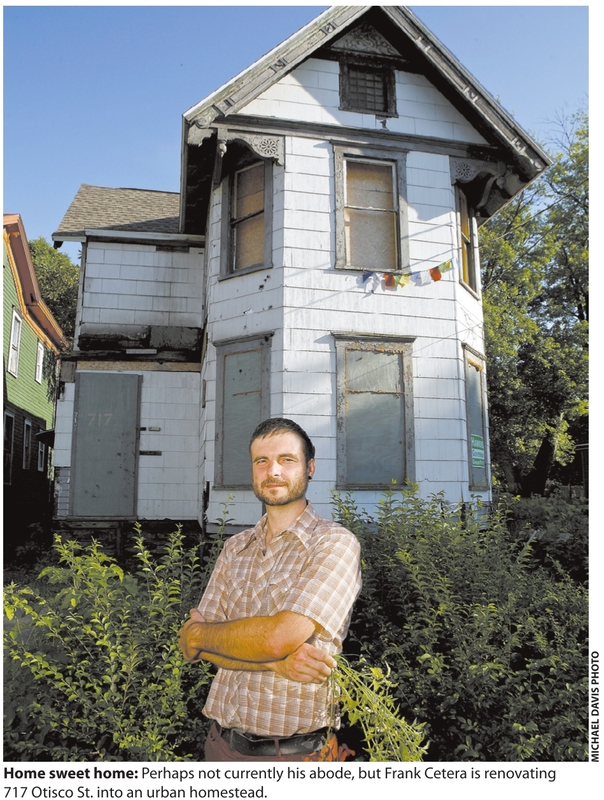 Meanwhile, he’s living at Bread and Roses collective, 162 Cambridge St., until the West Side home is habitable. Cetera came to Syracuse about five years ago to earn a master’s degree in forestry from the SUNY College of Environmental Science and Forestry. While studying there he met some likeminded people who inspired Alchemical Nursery and the decision to create an urban homestead. The nonprofit organization’s mission is to spread the idea of permaculture and to educate individuals to become more self-reliant and more closely connected to their ecological environment. In true green fashion, Cetera is using salvaged materials in this renovation. Windows discarded by others, found on curbsides all around town, and even as far as Quebec, Canada, while Cetera was on a bike tour, will encase the sunroom that will overlook the back yard. Just a few of Cetera’s eco-friendly, sustainable energy plans are for all of the appliances to be electric (until they can perfect a solar paneling system for energy), and the large masonry stove that will be built in a central location of the house to provide heat. He chose to exclude natural gas from the house and actually discourages its use because he believes the hydrofracking methods used to extract the fuel source from the ground are threatening our water supply. The reconstruction on the property is slowly taking shape, starting with the landscape and agriculture. The front and back yards are being tested for growth ability. This first season of planting will show Cetera which plants will grow best where, and what soil may need more attention than other parts of the yard. Cetera’s backyard permaculture was the site of a demolished home, so some parts of the yard are inhospitable to growth as of now, due to the rubble buried within. Cetera is remedying this by building raised beds for planting. The knowledge gained from this will assist the homesteaders in planning their growth space and landscapes appropriately, making the most from the available space for the next growing season. The renovations to the home itself have begun with demolition to the interior; Cetera is tearing out the drywall, to be replaced by clay plaster on top of the original lath. Some electrical work will have to be done, which Cetera is leaving up to the professionals along with the plumbing. Since part of Alchemical Nursery’s mission is to educate, the collective holds workshops throughout the year, covering such topics as ecological design, creating synergy, even gardening. This past spring, Cetera conducted a workshop in the future homestead’s back yard, during which he and eight helpers built an herb spiral using urbanite, or recycled concrete, blocks. The spiral configuration was deliberate; it occupies vertical growing space to minimize the use of horizontal space. 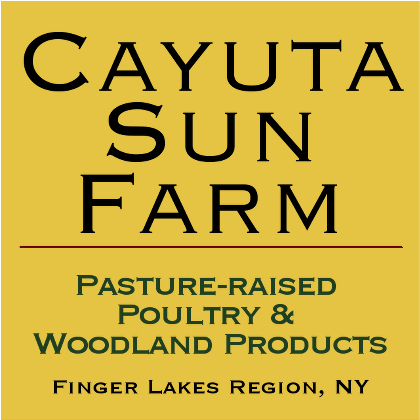 Cetera attended the seventh annual Northeast Permaculture Convergence, July 22 to 24, held in High Falls, N.Y., where he met Kaplan, who was speaking there. Considering that the eighth version is in the works, urban homesteading is clearly more than just a passing fad. Rather, it is a well-supported, educated transformation of communities based on pure ideals, with the earth, its inhabitants and future generations in mind.